Fans of Chicago-based bands Bound Stems, Chin Up Chin Up, and The Narrator will remember when these bands melded in 2010 to form Like Pioneers and record their debut album, Piecemeal. The musicians went their separate ways for a couple of years, but Like Pioneers was not destined to be a one-off project. 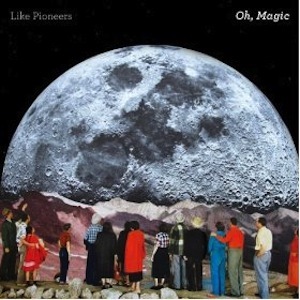 Now these talented musicians recorded and released their second album, Oh, Magic, which is described by Like Pioneers as “their first album as a band.” It is a lovely work of indie-pop with hints of guitar distortion woven through pleasing harmonies. The opening track “Champion” opens with spacey sounds that melds perfectly into a tough guitar and vocal combination that belies the heartbreak theme. ”Requiem For Some Band,” which could be the anthem for any group that’s planning to disband over personal differences; “Is a lie still a lie if no one hears it?” asks the singer. Finally, “Boggs” is reminiscent of Teenage Fanclub or Yuck; layer upon layer of guitar hooks, keyboards, and singsong vocals that culminate into a six-minute epic jam session. Fear no more, Like Pioneers; you will be making music for a good long while.